This is an amazing salad – and would be a snap to make really quickly if you bought pre-packaged pomegranate seeds and shelled pistachios. It literally takes 4 seconds in the Thermomix. Me – well, I bought pistachios in the shell and hand shelled them. Maybe I’m a traditionalist. Maybe it’s because you can always eat a few as you go. I also bought a lovely looking pomegranate and then resorted to YouTube to see what the easiest way to get the seeds out of a pomegranate was. That took me half an hour because I got sidetracked and wanted to see what a few people recommended as far as getting the seeds out. The recipe calls for Pomegranate Molasses and Rosewater. Pretty much everything else on the list is always in our fridge – beetroots, olive oil, chives, mint leaves, parsley leaves and dill. I’m blessed to have an amazing supermarket very close by, who happened to have the Rosewater and the Pomegranate Molasses. I’ve heard you can actually make your own Pomegranate Molasses in the Thermomix!! www.forumthermomix.com has details The recipe doesn’t actually say it – and I think I was right in doing it – peel the beetroots first. I top and tail them first, then peel them under cold running water – even a small trickle – to minimise the hand staining factor. 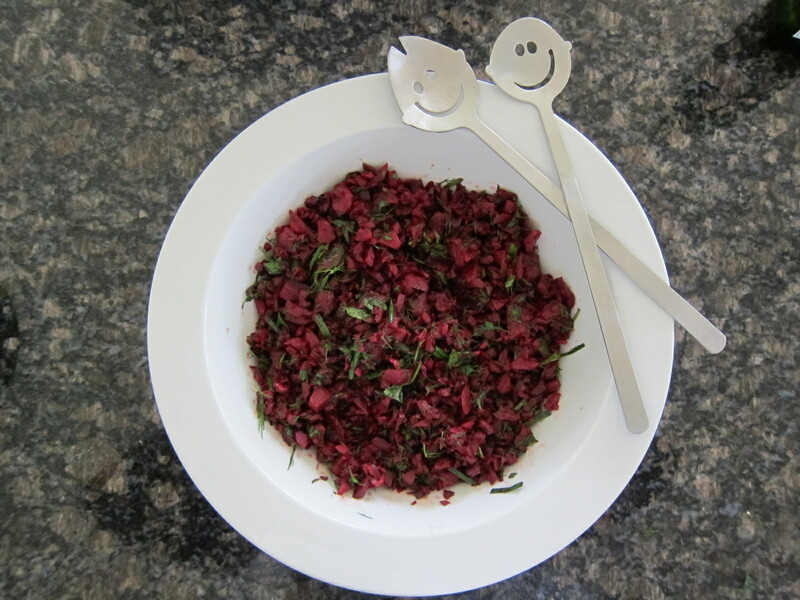 I cut the beets into chunks – about 8 chunks per large beetroot. I ended up cutting the end off very close to the end – probably too close to be honest. I cut again, and this time I could see some of the seeds. Then I scored through the skin which allowed me to peel off segments of the pomegranate. Watch out for the juice!! I then had a bowl filled with water and scraped the seeds into that, with my fingers. The water means that the seeds sink and the pulp floats – in theory at least. Most of the pulp floated but I did spend a while going through the seeds with a fine tooth comb to make sure there weren’t any dodgy ones in there. When I first read the recipe, I thought that the herb quantities sounded like minuscule amounts. Derr!! Of course herbs don’t weigh much…I hadn’t thought of that. I was very precise with the measurements and really took my time to pull leaves off and what not – I didn’t want a great salad ruined with stalky bits. I know my Thermomix is sometimes a little pernickety with the scales, especially when I am weighing small amounts. What I found helped was setting the Thermomix to scales with the basket in place. I didn’t attempt to weigh until I had what I thought was the correct amount of the ingredient prepared. If I was under, I turned it all out into a bowl, added some more and then started from scratch with the weighing. Not sure if this is just my Thermomix – Lord knows it’s had lots of moves and travels with me regularly. I tend to be a little heavy handed with the pouring of liquids, so to make sure I didn’t get the balance of flavours wrong, I was REALLY careful with the measurements for the wet ingredients. To make sure I didn’t over-indulge, I put the lid on the Thermomix, inverted the MC, and set it to scales function. I then poured each of the liquids into the MC, watching the scale reading while I did it. Once the weight was right, I just tipped the liquid into the bowl by turning the MC up the right way. Easy – and no mess to speak of. It was particularly good for the molasses – which can be a little slow-moving on cold days. I did the rosewater after the molasses to make sure I got all the molassessy (not even sure that’s a word!!) goodness into the salad. We had the family coming over for dinner, and I was planning to use the Thermomix for another component of the meal, so I made the salad part, tipped it into the serving bowl, covered it with cling wrap, and put it in the fridge for a few hours. I don’t think it did the salad any harm. Just before serving I added the pomegranate seeds and the pistachio nuts, and gave it a little stir. A winner! The family loved it – and it has been requested again… you can’t ask for better than that!